Arranged over the split level ground floor of one of these beautiful, quietly positioned Boscombe Road Victorian houses. The flat occupies the original ground floor reception space and keeps some wonderful fireplaces and tall interconnecting double doors, which can be opened to maximise light and the rather grand feel - as well as make the most of the unusually private and leafy aspect at the rear. Internal stairs with old stripped floorboards lead up to a double bedroom with another nice fireplace and a very green double aspect which gives a sense of privacy and seclusion. The property is part of a terrace of attractive houses in the section of Boscombe Road just below the junction with Findon Road. It is a prime and much favoured W12 street with Ravenscourt Park and Askew Road within a short walk. The shopping and transports hubs of Hammersmith and Westfield are within easy reach and Goldhawk Road or Shepherd's Bush Market tubes, along with Uxbridge Road's eclectic mix of shops, restaurants and theaters are also close at hand. 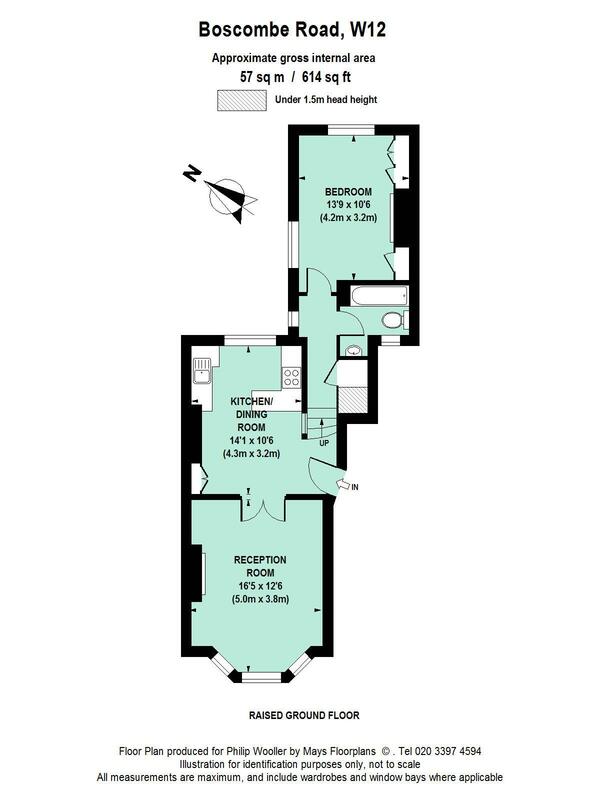 614 sq ft / 57 sq m approx.